Be steadfast in Me, says the LORD. I have made you unshakable and unmovable as you stand upon Me, your SURE foundation. I have made you sure footed. Though everything around you is shaking and insecure, you will stand and withstand all the storms of life. The ground under you will not shift or quake, for I alone Am your stability at all times. I Am your security. I AM your place of safety and well-being. I Am your shelter and the rock that is enduring. Nothing can touch you, My beloved, as I seal you in ME, your hiding place, till the storms pass over. The violence that is without cannot compare to the violence within you that will enforce My kingdom on earth as it is in heaven and affect your environs, says the LORD. With Me you will invade darkness with light. You will conquer death with MY life. With Me you will be a mighty conqueror and destroy the works of the enemy with valor and courage at all times. With Me you will proclaim and decree and watch it happen! For it is not enough for you to be safe and secure in these times and at all times, but I will cause you to shake things up with ME. For the winds of MY SPIRIT are greater than the force of the winds adversity. My light cannot be put out, but will extinguish darkness. I Will not be defeated and neither will you. I do not cower or back away from the enemy, and you will not either. I Am an enforcer, and I have created you to be a violent warrior that will enforce My kingdom purposes as you equip yourself in Me and stand, ready to fight the enemy and all his cohorts. Be steadfast immovable, and fully clad and armed in Me. There is a sound of a rushing mighty wind, says the LORD, and it is the winds of My SPIRIT that are moving and shifting and shaking and affecting, and changing and impacting, that are superior forces that will bring about My infallible will and purposes in all seasons and times that are fully under My control and command. 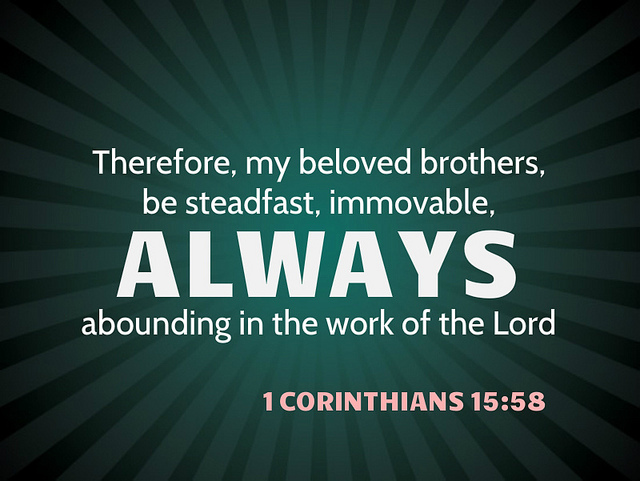 Be steadfast in Me and you will be the unshakable, immovable one who will always abound in My good work, and be the undefeatable one who will be prepared onto every good work and fulfill every good work that I have called and equipped you to do at all times, says the LORD.